November, 2015 set temperature records in many parts of the world. Graphic courtesy of NOAA. It’s getting hard to find anything new to say about the global monthly land and sea temperatures: Hot this month, hot last month, hot the month before. 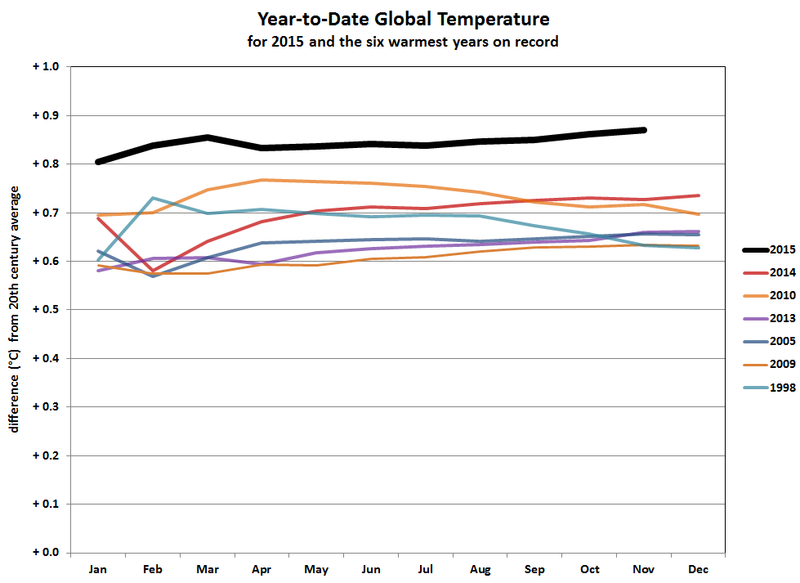 Global temperatures have set a monthly record seven months in a row. Kind of a yawner after a while. And didn’t they just fix the problem in Paris? Complacency is not the proper attitude towards global warming. It is happening — faster than ever. It’s not too late now to do something about it, but it may be too late soon. The Paris agreement calls for an attempt to keep the increase in temperature from pre-industrial times to 1.5 degrees Celsius (1.5C). Or at least 2C. But November showed that we are already halfway to 2C and two-thirds of the way to 1.5C. The COP21 Agreement doesn’t even start to take effect until 2020. At the rate the world is warming, 2020 might see global temperatures already past the 1.5C mark and well on the way to 2C. The subtropical Pacific Ocean from the central Pacific east to the coast of Mexico and Central America broke heat records. Most of Mexico and Central America broke heat records. Much of northern South America broke heat records. The Gulf of Mexico and the Caribbean Sea broke heat records. Most of the tropical Indian Ocean broke heat records. The India Ocean along the west and south Coasts of Australia broke heat records. Southeast Asia and adjacent Indonesia broke heat records. Scattered locations including parts of southern Scandinavia, western Africa, southwestern China, and the waters north of Scandinavia broke heat records. There were no new cold temperature records, though there was a patch of much below normal water south of Greenland. The period from January to November, 2015 set records in many places. Graphic courtesy of NOAA. The January to November global temperature follows the November trend in some ways, but diverges in others. When the temperatures are averaged over the first eleven months of the year, the record temperatures cover even more of the globe. The central tropical Pacific and all of the central and eastern sub-tropical North Pacific saw record warmth. Mexico, Central America, and the northern half of South America saw record warmth. The Caribbean Sea, but not the Gulf of Mexico, saw record warmth. Most of the sub-tropical North Atlantic Ocean, and the western North Atlantic north to Nova Scotia saw record warmth. Parts of southern Africa saw record warmth. The entire tropical and sub-tropical Indian Ocean, both North and South, plus a strip along the Australian coast. Parts of southern Australia saw record warmth. Southeast Asia and adjacent water, and parts of Indonesia saw record warmth. The only places much colder than normal (there were no records) were the waters between South America and Antarctica, and the waters south of Iceland. November global precipitation was consistent with El Nino. Graphic courtesy of NOAA. Precipitation can be highly variable from month to month. But the global rainfall pattern for November looks like what is expected during an El Niño. The west coast of the United States received normal rainfall after four years of drought. The winter is expected to be very wet, and December has started out in that direction. The central and southern United States were wet, with scattered precipitation records in Oklahoma, Iowa, and South Carolina. This, again, is consistent with El Niño. Southern South America, northern Europe, and Japan were also wet, while a large area of dry weather covered southern Europe, northern Africa, and part of the Middle East. It’s now a foregone conclusion that 2015 will be the hottest year since pre-industrial times. Graphic courtesy of NOAA. If global warming simply meant that the temperature will rise 2C everywhere, it might prove relatively easy to deal with. But there are already signs that some places might experience much larger swings. A number of feedback mechanisms are at work — both positive and negative. The most significant of these involves the earth’s albedo — the percentage of sunlight that is reflected. Ice and snow have high albedos; water, asphalt, and bare land have lower ones. As the arctic warms and the ice melts, more sunlight is absorbed by the exposed water. This is one reason the arctic is warming at twice the rate of the rest of the world. Warm air has the capacity to hold more water vapor than cooler air. As the atmosphere warms, the amount of water vapor, a potent greenhouse gas, increases — a positive feedback. On the other hand, if there is more precipitation (a reasonable expectation if there is more water vapor), it is possible that there will be more snowfall; this would be a negative feedback — the snow would reflect more sunlight. Can We Rely On The Temperature Trend? Three different computations of the change in ocean heat content from 1955 to 2014 all show the same trend. Graphic courtesy of EPA. We will have to wait another month to put 2015 into the record books. But the rise in temperature from 2014 has been spectacular and unprecedented. Meteorologists expect (and hope) that El Niño is the primary driver of this expanded warming. But CO2 has also risen to new record levels, and its rate of increase has also been going up. The fact that sea temperatures are, relatively, rising faster than land temperatures may be an ominous sign. Experts suspect that some of the heat from global warming may be stored in the oceans, potentially to be released at some time in the future. Or is the future now?. People who are deeply into politics won’t hear what the data says. You can almost see their faces become rigid when you mention the words, global warming. It’s a standard human phenomenon that people will believe, not the truth, but what they WANT to believe. Thank you for this article.